Youth Leadership Team member introduces the inaugural Youth Mayoral Forum. Pictured are DC Attorney General Karl A. Racine (left) and Democratic mayoral candidate John Butler (right). Critical Exposure (CE) teaches and inspires underserved youth to harness the power of photography and their own voices to become effective advocates for positive changes in their schools and communities. Youth at CE use photography and writing to depict their daily lives, shift public narratives about youth of color, and elevate their voices by meeting with city decision-makers to hold those in power accountable for addressing the issues important to them. Through in-school programs, youth internship, a fellowship program, and summer programs, CE hopes to achieve a world in which historically marginalized youth are empowered as leaders and equipped with the skills to make their schools and the world around them more aware and responsive to their needs. Starting in January 2018, CE joined with DC Alliance for Youth Advocates (DCAYA) and Mikva Challenge to host a youth mayoral forum planned, organized, and led by a 15-member Youth Leadership Team comprised of youth from all over the District, including five from Southeast D.C. Also, five schools were represented: Thurgood Marshall Academy (Ward 8), Ballou High School (Ward 8), E.L. Haynes (Ward 4), Benjamin Banneker High School (Ward 1), and Eastern High School (Ward 6). Five CE youth were part of the leadership team. For more than four months, the team of youth leaders and adult allies met to set vision for the forum, learn more about local politics, discuss and analyze the issues affecting their lives and communities, take on leadership roles, research the mayoral candidates, craft and implement communications strategies for forum outreach, and scout out venues. Andrenae B., a Youth Leadership Team member, spoke with Mayor Muriel Bowser on the Kojo Nnamdi Show on WAMU 88.5 in early May. In light of the DC Public School diploma scandal this past spring, Andrenae asked the mayor, “How are you going to make sure that my diploma as well as my peers’…has the same value as other students in DC?” Following further dialogue, Andrenae personally invited Mayor Bowser to the forum. 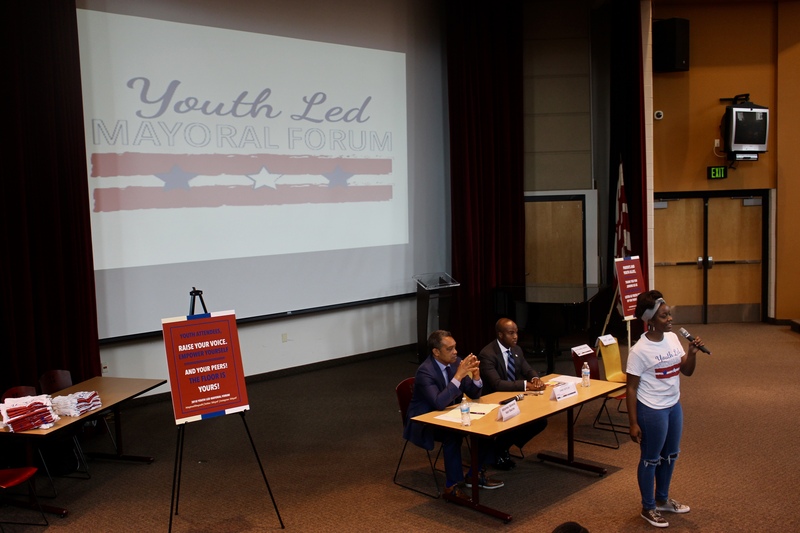 On May 19, 2018, more than 150 community members attended the youth-led forum held at Luke C. Moore High School to engage with Democratic mayoral candidate John Butler and D.C. attorney general Karl A. Racine, who was running unopposed for reelection. During the two-and-a-half-hour event, only youth had the right to question the candidates on a range of issues including mental health, sanctuary cities, disproportionate school punishments for students of color, vocational training, gentrification, and gun violence. The event also offered an opportunity for CE youth to highlight their ongoing financial literacy campaign and ask the candidates about their vision for financial literacy in schools. During the forum, Butler and Racine made verbal commitments to expand restorative justice in schools, improve the relations between the police and local communities, and promote solutions to school gun violence other than arming teachers. Additionally, Butler committed to creating vocational training opportunities and increasing food access to underserved communities east of the Anacostia River. Notably, Mayor Muriel E. Bowser, who is running for re-election, did not attend the forum. In response, the Youth Leadership Team hosted “Part II of the Youth Mayoral Forum” on June 2 at 12th Street Christian Church. Mayor Bowser attended and responded to young people’s questions, further demonstrating to the youth involved that they should – and will continue to – have a significant voice in the discussions surrounding decisions being made that affect their success. After the successful inaugural mayoral forum, CE will continue to partner with ally organizations like DCAYA and Mikva Challenge to provide youth with additional opportunities to play a bigger, more visible role in city politics, and to teach and inspire underserved youth to become effective organizers for positive changes in their schools and communities. Marisa Stubbs is Critical Exposure’s Development & Communications Director and brings more than 15 years of experience in nonprofit administration, fundraising, youth development, program management, and curriculum development. Outside of a stint as a Peace Corps Volunteer in South Africa, she has focused primarily on building the capacities of youth and small, community-based organizations. Prior to Critical Exposure, Marisa served as Executive Director of Food For Life, a social enterprise and culinary job training program for opportunity youth in DC that she founded in early 2011.